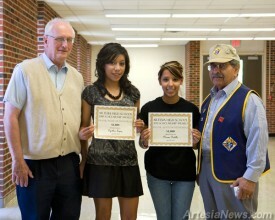 Two high school seniors are awarded a $1,000 scholarship from the Knights of Columbus Frank Aguilar Memorial Scholarship. Pictured from left are Grand Knight David Boneau, scholarship recipients Cynthia Lopez and Noemi Padilla and scholarship chairman Felipe Guerrero. According to Boneau, funding for scholarships comes from fundraising events held throughout the year. Lopez will be studying nutrition at Texas Tech and Padilla will be studying nursing at New Mexico State University. subscribe in print and on the web!